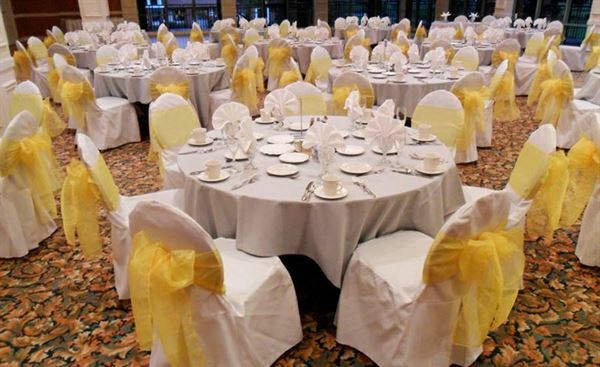 Special Event Linens specializes in renting Chair Covers to Hotels, Banquet Centers, Country Clubs, and other Venues for Weddings, Corporate Events and Themed Parties throughout Orange County. Welcome to GotChairCovers.com, Southern California's premiere source for chair covers. From delivery and installation to removal and pickup, Special Event Linens is a full service chair cover rental company. We have been providing chair covers to hotels, banquet facilities, country clubs, caterers, party rental stores, convention centers, bridal consultants, florists, wedding coordinators, party planners and brides in Orange County and Los Angeles since 1995. Special Event Linens delivers chair covers to cities throughout Orange County and the Greater Los Angeles area.